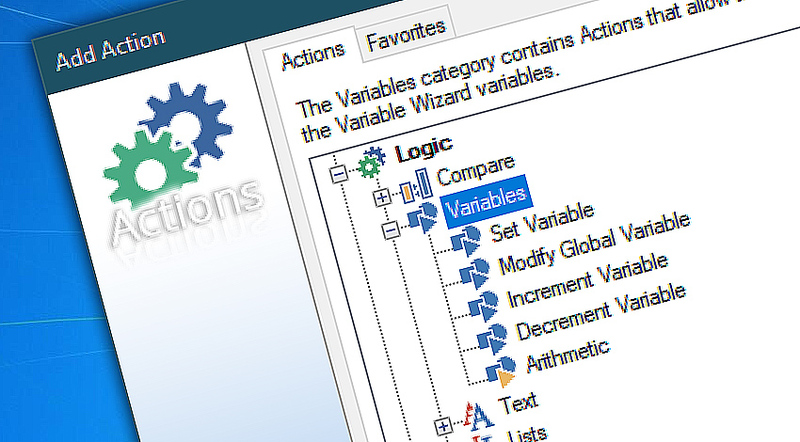 The Variable category features Actions that allows to extend the data flow among Actions as well as to increase and decrease numeric values of variables. Custom variable names can be of any length and support unicode characters, allowing to apply truly versatile naming schemes for dynamic context-specific values. When using variables for storing numerical data, it is possible to store, increment or subtract very small and very large numbers, both positive and negative. Scientific or exponential notation is supported as well. Set variable allows to create or update a custom variable and write a value into it. Increment variable adds a specified amount to variables that contain numeric value. Decrement variable subtracts a specified amount from variables that contain numeric value. Set variable · create or update a variable with a specified value. Increment variable · add a number to numeric variable. Decrement variable · subtract a number from numeric variable. Love Automation Workshop. Wish I knew sooner. —Jaymes G.